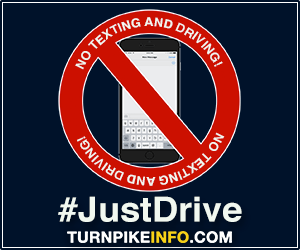 New Jersey toll classes, payments and fines. Any driver that uses a toll road in New Jersey is expected to pay the toll for that roadway. Depending upon the road or bridge traveled, New Jersey's tolls are set by either the New Jersey Turnpike Authority, The Port Authority of New York and New Jersey, or the South Jersey Transportation Authority. See below for additional information about toll classes and paying violations. MISSED TOLL / WRONG LANE? Missed toll notices can include a receipt given for "Patron without funds". Do not mail cash! Check, money order or cashier's check are accepted. If you missed a toll or used the wrong toll lane, you must make a payment within 48 hours to avoid the generation of a traffic summons for a toll violation. If you miss a toll on a ramp, you can pay at a barrier, such as the Pleasantville toll plaza or the Egg Harbor toll plaza. Just notify the attendant you missed a toll, and it will be added to your barrier charges. You may visit the SJTA administration offices at the Farley Service Plaza. The receptionist will be able to accept your toll payment. In the memo line of your check or money order, note the day and time of the missed toll, plus the state and license number of your vehicle. E-ZPass users are provided a page where they may pay the violation or dispute it. To use this page, you must have the toll violation number and proper vehicle information associated with the toll violation. If you have a new car with a temporary license plate, and you received a violation, call the toll violation center at 973-368-1425 or 888-288-6865. 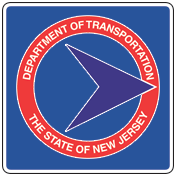 For violations on the Atlantic City Expressway, you may also contact the South Jersey Transportation Authority to resolve your issue. The SJTA may be reached at 609-965-6060. Have your E-ZPass account information ready for the operator. The cash payment system speaks for itself. When you pay by cash, you are responsible for having sufficient cash funds to pay for your tolls while driving on New Jersey toll roads. If you are unable to pay your toll, you will receive a ticket for the amount of the unpaid toll, plus an administrative fine. New Jersey is on the E-ZPass electronic toll collection network, so any transponder that displays the E-ZPass or IPass logo will be accepted in New Jersey. Any E-ZPass issued in any state, and the IPass from Illinois, are all compatible with New Jersey E-ZPass. Vehicles with these passes may use any E-ZPass lane. If you have an E-ZPass issued in another state, you will still get the discounted toll rates in New Jersey. However, to get off-peak E-ZPass rates, you must be using an E-ZPass issued by New Jersey. Make certain you have sufficient funds on your E-ZPass account to pay for the toll charges you will incur; otherwise, it will count as a toll violation. The peak driving periods are from 7 a.m. to 9 a.m. and 4:30 p.m. to 6:30 p.m., Monday through Friday. All day Saturday and Sunday are also considered peak periods. During this time, those using E-ZPass to pay tolls will be paying the peak rate. Holders of the New Jersey E-ZPass will automatically get the off-peak E-ZPass discount rate when it applies. This graphic provides general information about how to count the number of axles on your vehicle. See the information below for detailed information for New Jersey. The classification system is simple in New Jersey. Tolls are calculated based on the number of axles your vehicle has. Any trailers that are towed behind your vehicle will also have the axles counted, so when you count the axles on your vehicle, be certain to add the number of axles on the vehicle and the trailer to get your total. Motorcycles count as a car, including motorcycles with a sidecar. Motorcycles with a trailer would count two axles for the motorcycle, plus the number of axles on the trailer, to get a total. In New Jersey, there is no class of vehicle higher that the 6-Axle class. If you have seven or more axles, use the 6-Axle Class. 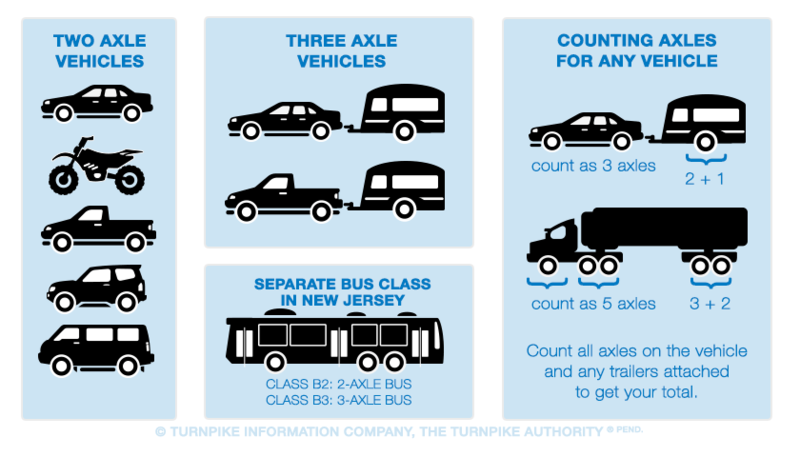 New Jersey has a separate class system for buses, but it is still based on the number of axles.